The Food Bank is a network of local charities. 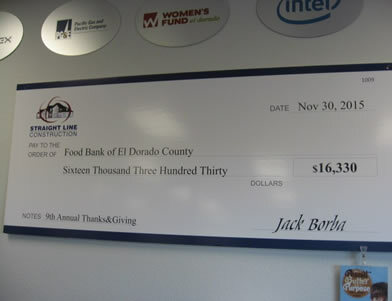 When you make a contribution, your donation helps nonprofit establishments throughout El Dorado County. No other single nonprofit can help so many. Your dollar simply goes further here. How can we do it? First of all, our labor force is almost all volunteer based. Volunteerism is vital to our mission, and the savings in administrative costs are primarily used to provide more food relief. Efficiency is of high importance to us, we know that every penny adds up, and every penny saved can help someone else in our community. In these challenging economic times, good families are struggling in El Dorado County. Please join us in our efforts to feed the folks. We appreciate your support of the Food Bank. Know that your donation will be used equitably and efficiently to ensure the Food Bank’s continued annual operations of feeding our county’s at-risk population. Make a one-time donation or setup an automated monthly donation to the Food Bank.